I'm going to the car auction tomorrow for a 2016 m6 touring or grand touring without i-eloop. The car has to have heated seats and backup camera. Since 2015 and 2016 have different interior, Should I look at 2015 models as well? I do like dash on 2016. But people said 2015 has a better interior quality. Please give me some advice. Thank you all. If you want heated seats, you have to look for a GT. If you get a GT with heated seats, it will also have i-eloop. I have never seen a GT with heated seats without i-eloop. Your best bet may to be to get a Touring and add aftermarket heated seats if you do not want i-eloop. FYI- i-eloop cannot be bypassed to my knowledge. Also, if you want OEM Carplay/Android Auto, go with the 2016. I do not know about many other interior differences. The GT comes with leather and the touring comes with leatherette. Also, the 16s come with electronic parking brake. The Touring may or may come with foglights and /or Bose and sunroof. Touring with Tech package will come with those options. All tourings and GTs should have backup cameras. Last edited by 93blkongreenpro; 03-19-2019 at 12:03 PM. What I have learned is different. Please look at this PDF file (page 7) for 2016. The heated seat is in Technology package (no i-eloop) on Touring. The i-eloop is in Technology package on Grand Touring. Those two Technology packages are different on T and GT. Correct - the i-eloop package was an addition to the GT trim for the earlier models and is not included on many GTs. I *thought* they had included it on the later models though (late 2016+) but I could be wrong. All GT's come with heated seats. My 2005 6s GT had heated seats. My 16 has heated seats and no ieloop as I didn't want the tech pack. If i remember, the tech pack on the 16 GT was another $2500-$3000, and I didn't feel the upgrade justified the cost. All Gt's DO NOT have I-eloop... most dont. Now the diff is in the tech package. On the touring, the tech package brings a lot of the stock gt's features to the touring level. Minus heads up display and a few other little gt only things. Get the 16... much better interior and infotainment. For those of us stuck on Gen I technology, why wouldn't you want i-eloop? The i-eloop tech brought about Mazda's attempt for regenerative braking. Power was stored in a 2nd battery. It was also supposed to bring better gas mileage by closing shutters on the front of the vehicle allowing better aerodynamics. BUT... this required an expensive second battery that is generally only avail at the dealer. The i-eloop was included in the extra tech pack only avail in the GT. 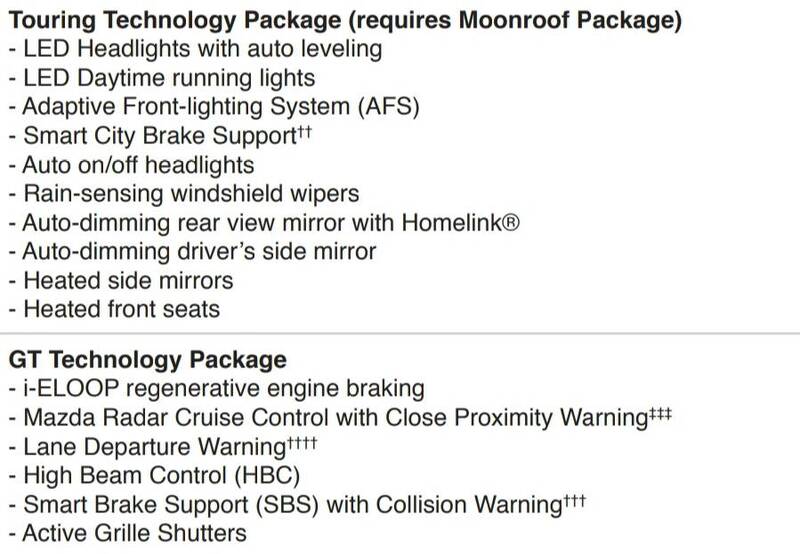 The higher package also included the lane dep warnings, higher end cruise control, and high beam control. I-eloop was not a cost efficient system, and I am glad my car is without. For me, it's just another possible part to break and high cost to maintain/fix with less to no benefit. The capacitor is one thing, the battery is different from other trims too, and the converter under driver's seat.